Some of the most fascinating pottery ever made in Japan dates back to the Jomon period (10,000 BC to 300 BC). The open-pit fired large vessels had the most amazing decorative features and continue to inspire potters today, most notably the late Okabe Mineo, Mashiko's Shimaoka Tatsuzo, and Bizen's "kiln god" Mori Togaku. 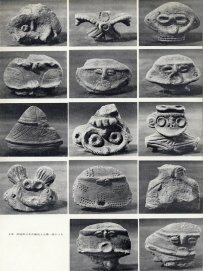 In 1990, the Shigaraki Ceramic Park Museum hosted an exhibition entitled Primitivism in Contemporary Ceramics highlighting many Jomon works and how they relate to what's happening now. The grand flowing traditions of Japanese ceramic art thrive today due to the living presence and inspiration that past works impart. There is no now without the past and there is no future without the now. 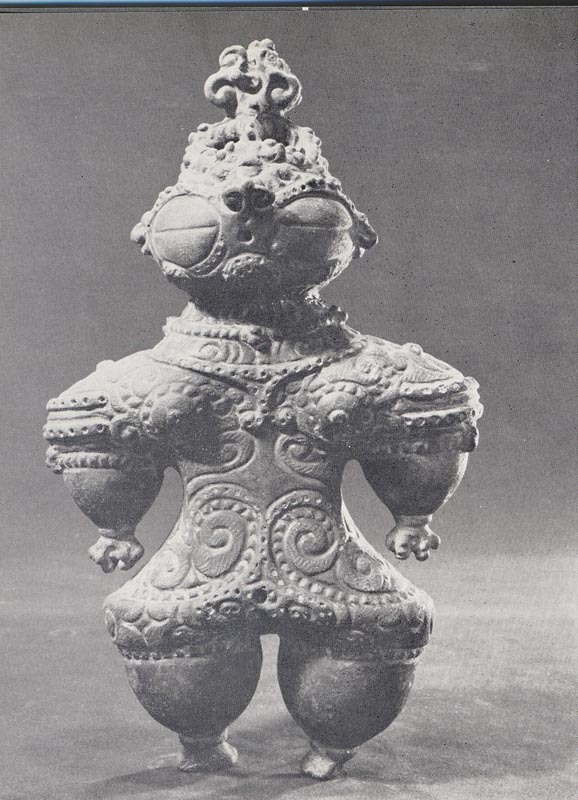 Some of the most intriguing works from the Jomon period are clay figurines called dogu (pronounced dough-goo). There are many theories on what they were used for with the main agreement being they were a talisman for good health or safe childbirth. As many were excavated in fragments, it's believed that after the wish was fulfilled, or not, the dogu was broken and thrown on the trash heap; that's where many were discovered. 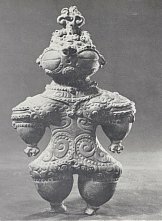 Another theory is that these were goddesses to whom Jomon people prayed to for food and health. Other explanations are toys for children, funerary offerings, or objects used in some unknown ritual. And, of course, there are those who believe they were aliens from outer space. 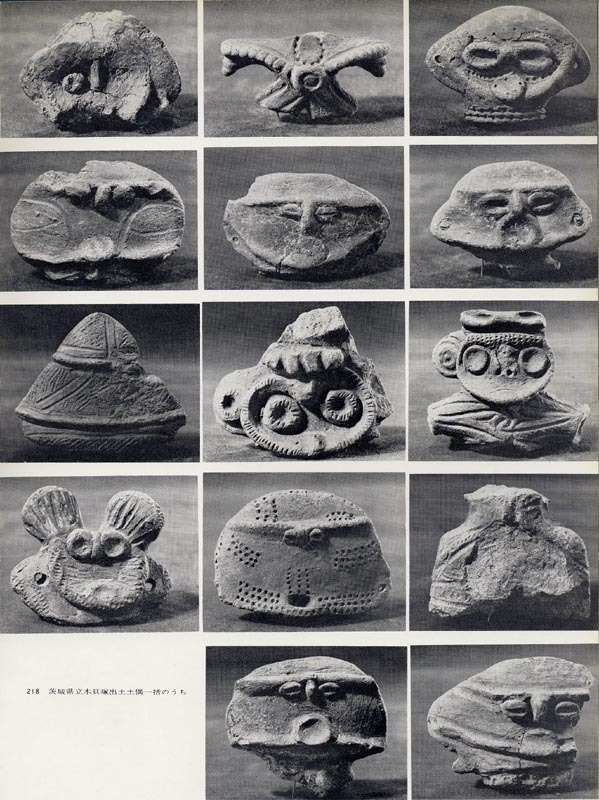 Yet, if you look at similar primitive artifacts from around the world (the Valdivia culture of Ecuador, for example) there is a certain resemblance that can't be explained in logical terms. 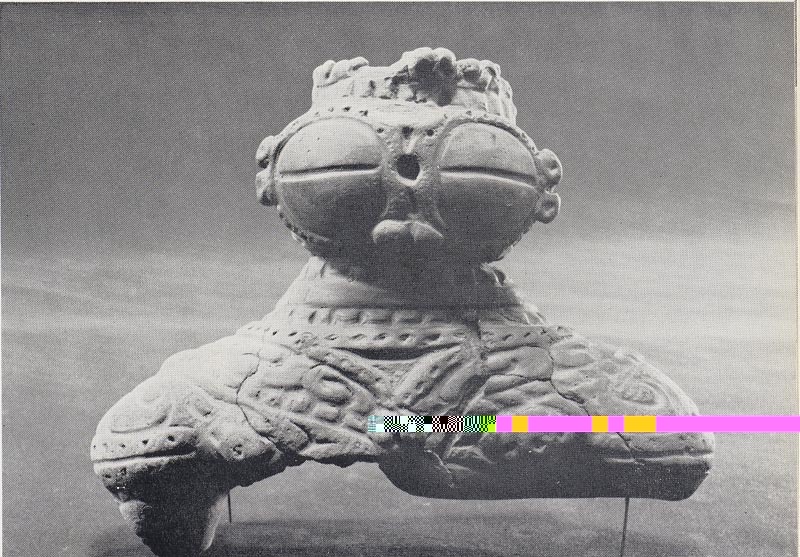 It might have been part of the collective consciousness of the times though, or did earth in fact have space-suited visitors from a distant galaxy? This dogu sure seems to fit the match! 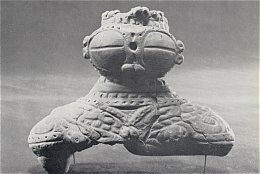 Dogu were found all over Japan with northern Japan, the Tohoku region, yielding the most variety. 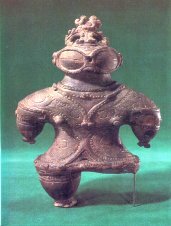 Dogu first appeared in early Jomon but began to flourish in Middle Jomon through Late Jomon. 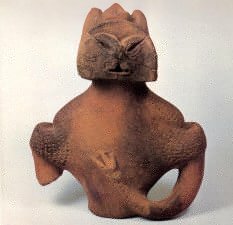 (For a timeline outlining the development of Japanese pottery, please click here.) 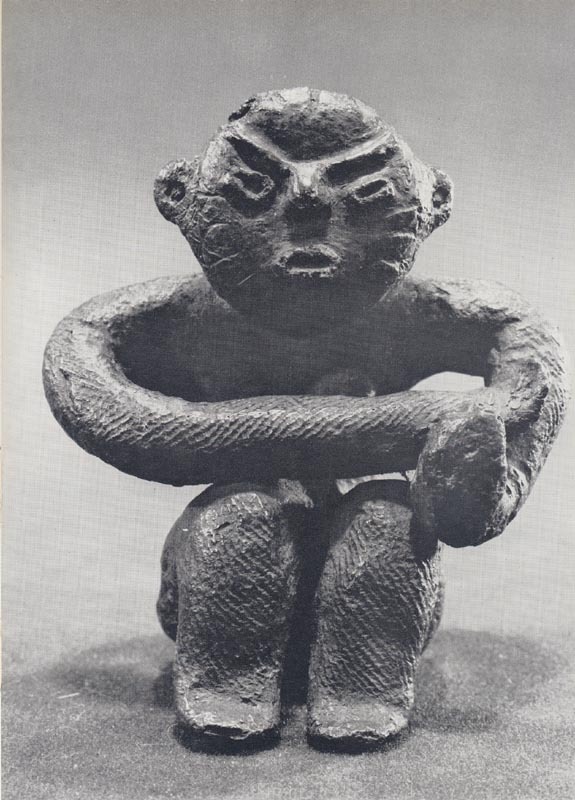 Many of them have the distinctive Jomon rope-cord patterns while others have been intricately carved with arabesque-like designs. Some in outer-space garb are known as the "goggles type" and no explanation is needed for that naming. Whatever the markings, they are all eerily moving and can't help but spark one's imagination in wondering about life so many thousand of years ago, and the miracle it is today. 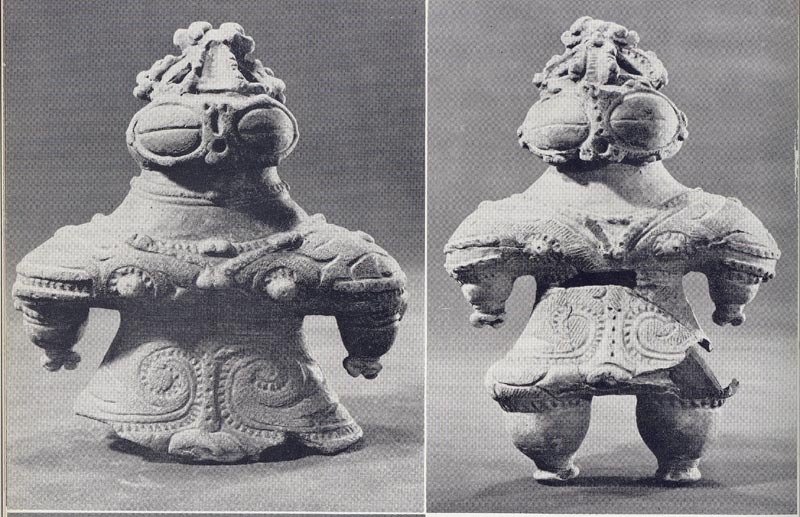 As Joseph Campbell once wrote: "Take, for example, a pencil, ashtray, anything, and holding it before you in both hands (in this case looking at dogu), regard it for awhile.  Forgetting its name and use, yet continuing to regard it, ask yourself seriously, What is it? 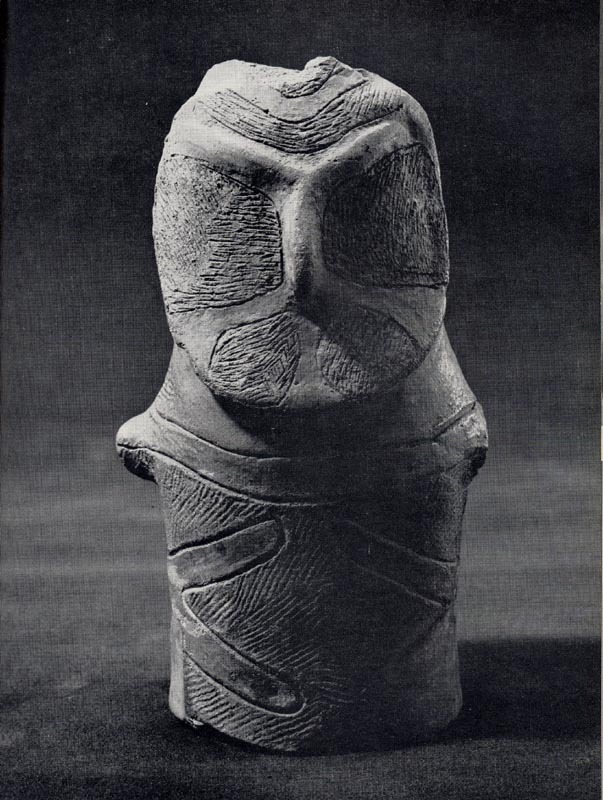 Its dimension of wonder opens, for the mystery of the being of that thing is identical with the mystery of the being of the universe, and yourself."